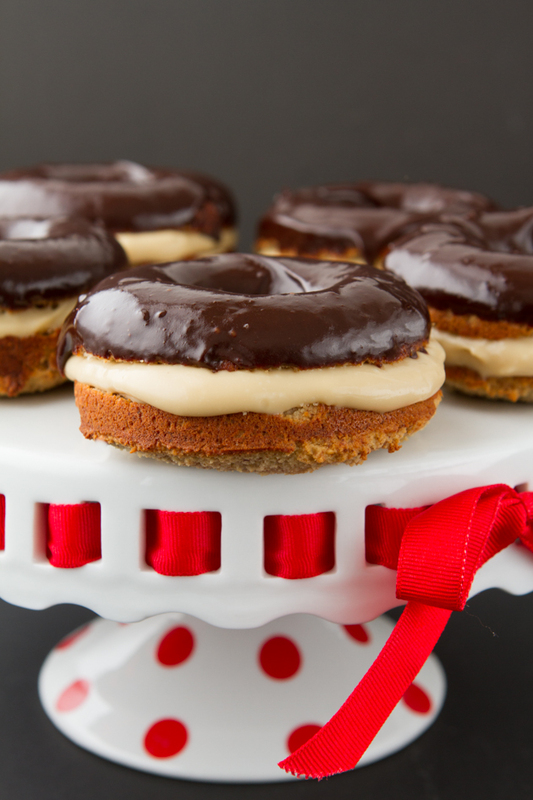 Gluten-free and paleo donuts cut like sandwiches filled with dairy-free vanilla custard and topped with melted dark chocolate. 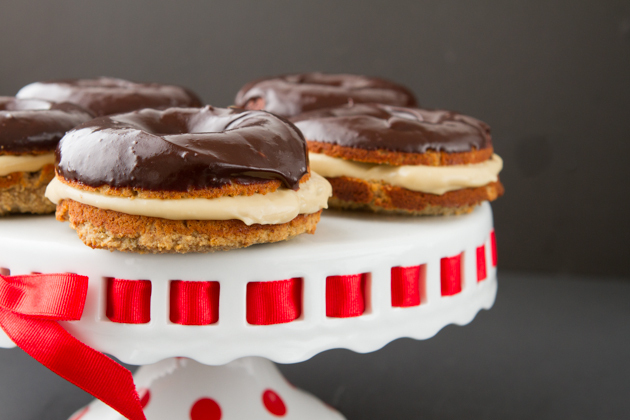 Traditionally, Boston Cream Donuts are yeast-risen donuts with custard in the middle. They’re fried, they’re glutenous and packed with sugar. 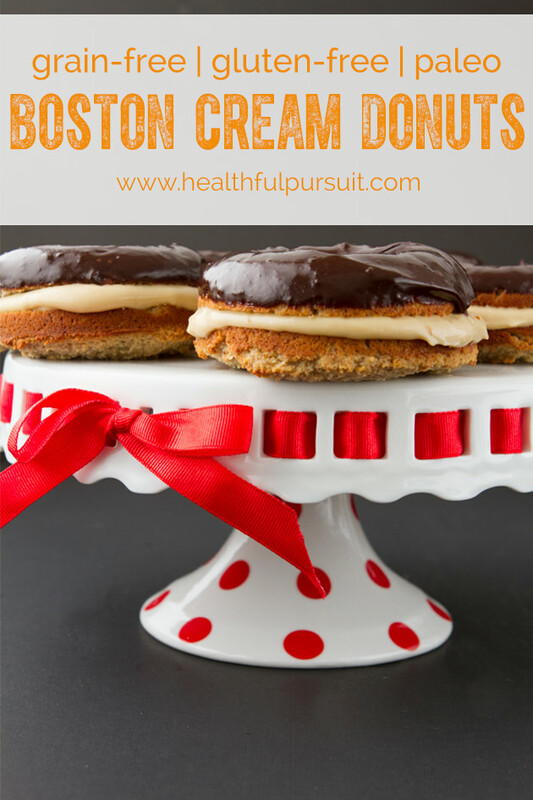 I’ve seen a couple of grain-free and paleo Boston Cream Donuts out there but when I saw sandwich-like versions in Ashley McLaughlin’s Cookbook, Baked Doughnuts for Everyone, I was intrigued. Baked Doughnuts for Everyone has 101 doughnut recipes, all completely gluten-free! A cookbook that allows you to make doughnuts in the comfort of your own kitchen without fussing over a fryer. All you need is a doughnut pan, a mixing bowl, and the same ingredients that you use in my recipes. I used a combination of two recipes in the Baked Doughnuts for Everyone Cookbook as inspiration for this recipe. 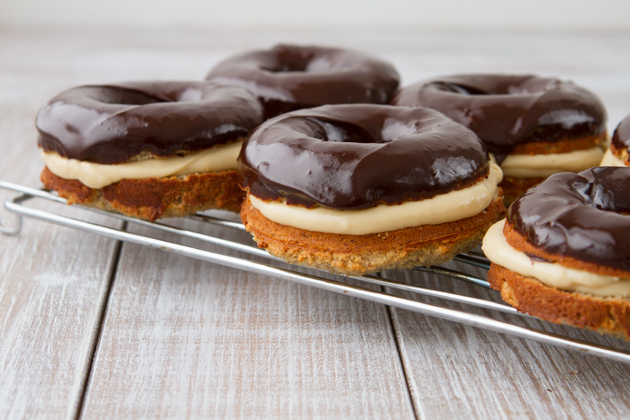 The concept, was inspired by Ashley’s gluten-free Boston Cream Doughnuts recipe (page 29) and the grain-free doughnut dough is directly from the “Healthed-up Hits” section (page 143) — a chapter in the book filled with lighter and healthier doughnut recipes. There are some very unique flavor combinations and savory donut recipes in this cookbook. Key Lime Pie, Apple Fritter, Jalapeno Cheddar… crazy! 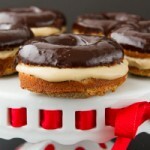 But my heart will always be with the Boston Cream. Growing up, there was this Texas donut shop down the street. You know, those bakeries that make donuts as big as your face? Or… bigger? They had Texas donut-sized Boston Creams. I’ve never eaten such a large beast of a sugary treat in my life. Crazy thing is? I went there once a week! Pretty sure that’s what contributed to my sensitivity to gluten, right there. System overload! But these little gems won’t overload your system. They’re a perfect size, they’re grain-free, as whole food as you can get (it’s still a donut) and hey, there isn’t any yucky sugar in the recipe, either. In a saucepan, combine the sugar, ¾ cup cream, and the vanilla. Cook over low heat, stirring constantly with a wooden spoon, until the sugar is dissolved. Raise the heat and scald the mixture. Meanwhile, place the arrowroot starch in a medium bowl. Using a wire whisk, gradually whisk in the remaining ¼ cup cream until smooth. Add the egg yolks and whisk until well blended. Slowly pour ⅓ cup of the hot cream mixture into the yolk mixture, whisking constantly. Gradually whisk in the rest of the hot milk. Return the milk-yolk mixture to the saucepan and heat over medium heat for 2-3 minutes until thickened, whisking constantly. Remove the pan from the heat and whisk in the oil. Transfer to a bowl, cover with plastic wrap, pressing it directly onto the surface, and refrigerate until chilled. Place all dry ingredients in a medium sized bowl and whisk to combine. In a separate large bowl, combine all wet ingredients. Add wet to dry and stir to combine. Allow to sit for 2-3 minutes to thicken up. Place the batter in a piping bag or large ziploc bag with the end cut off the end so there’s about a ½-inch opening. Fill each donut cavity ¾ to the top. Be careful not to overfill or the doughnuts will overflow while cooking. Place in the oven to bake for 14-17 minutes, or until toothpick inserted comes out clean and edges are just beginning to brown. Meanwhile, add chocolate chips and coconut milk to a double boiler and melt completely. Then, slice donuts in half, like you would a bun for a sandwich. Scoop pudding on the bottom half and set back on the cooling rack. Dip the other half of the donut in the melted chocolate and top on the pudding half. Serve! Sugar: feel free to use coconut sugar! 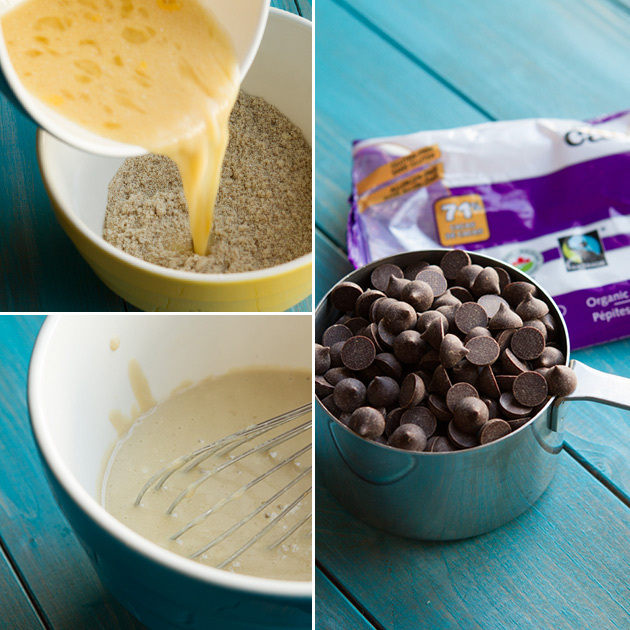 I used Fairtrade dairy-free chocolate chips from Camino for this recipe. The higher the quality of chocolate, the shinier your chocolate topping will be! I shared mine… now it’s time to share yours! What is your favorite childhood donut memory?